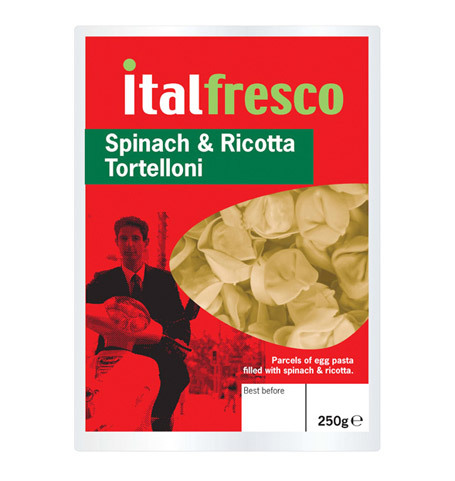 A range of chilled pasta and ingredient products including authentic Italian pizzas. To strengthen the existing brand and design new packaging to more accurately reflect the brands Italian credentials. We created a number of concepts to introduce red green and white using the ubiquitous basil leaf as the green, together with strong themed Italian iconic imagery and others like 'Roman Holiday' to imbue the packs with a strong Italian flavour. Striking red with black action images contrast with the lightness of the pasta giving the dynamic packs a more modern retro edge to their competitors, and a contrast to the usual 'sepia/olde worlde' imagery.